The expected median price for a 20" late 50s early 60s cymbal would be 3 times the asking price of $35 if it had a trademark stamp. Smells Italian - many of those only had ink to start with, and it's long gone. If it is Italian then the expected price would still be twice the asking price so at least I'm not worried that it is overpriced. I think A Zildjian because of the patterns of lathe chatter on the underside, and the lathing on both sides which is in the mid 50s to early 60s style with "rings of Saturn". Although Italian cymbals have those as well they are different in style. I'm still working on my checklist for distinguishing Italian from A Zildjian cymbals. It certainly isn't easy for some cymbals, especially working just from small photos. One of the tests you can try if you have the cymbal in your hands is to measure the diameter accurately. If is is 50 cm (19.7 inches) that increases the likelihood it is Italian or some other country using the metric system. 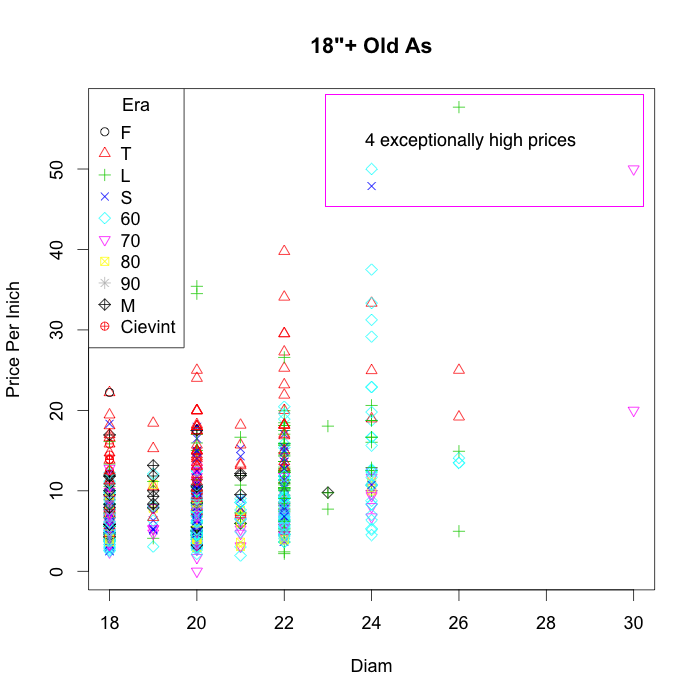 If it is 20 inches (or occasionally slightly oversized in the 1950s) that increases the likelihood it is A Zildjian. Go back far enough in time and the list of countries producing cymbals targeting metric diameters (or producing undersized cymbals) isn't that long: Italy, Turkey, China. I currently have 3 unmarked 14 inchers, one 16 inch and a 20. Bought in a batch. It can happen. Regardless, if that sucker sounds good grab it for 35 bones! If it’s Italian then they shared lathe workers with zildjian.... I was thinking later 50s early 60s as well and was discussing it with rick gier this am as well. Thanks Steve for confirming. They took $22 for it. Got it out in the sun and still see nothing.... I’ll look closer when I’m not at work and short on time. 18 Avedis no-stamp with rivets. 1913 grams, measures 18" exactly. Looks 1950s, probably drilled for rivets later. Was always curious, comments welcomed, thanks. Good Night. That's a buck and a dime per inch. Maybe you should have looked for the unstamped 30 incher hidden in the back room? Not to chatter on, but the only reason I add "or early 60s" is that I've got so many examples like this cymbal below which has a 60s trademark stamp, and other attributes which put this more on the 50s side of the arbitrary decade boundary, combined with bell lathing which is more 60s. Depending on whether you think the production clues date the manufacture of a cymbal (hammering, lathing, chatter marks, mounting hole diameter, bell shape, etc) or the trademark stamp dates the manufacture of a cymbal (the trademark which is loosely called "60s stamp") you might want to include "or early 60s" for the mystery cymbal. 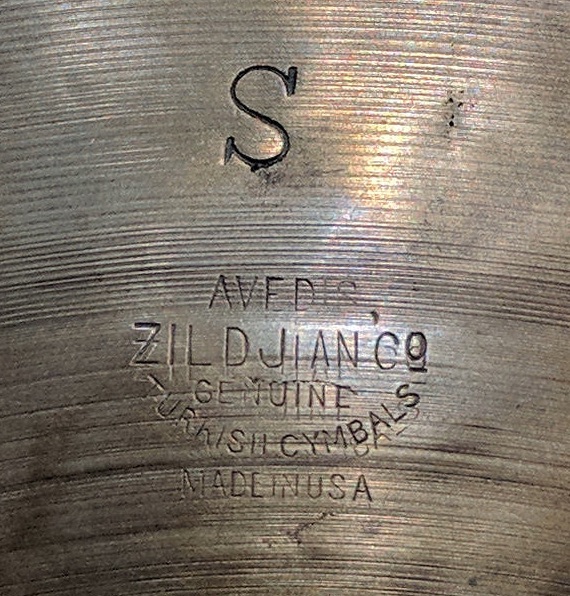 I favor the view that production clues date the manufacture of a cymbal, and the trademark stamp tells you which die was used when the cymbal was trademarked after being selected from the vault to fill an order. But given the level of precision we actually have in assessing production year for the late 50s early 60s (by whatever means) I still tend to add the "or early 60s" because the boundary isn't that clearly established as January 1, 1960. It might be 1961 or 1962. Maybe we're getting to the the point where I should just take the plunge and simplify the language to "50s Zildjian". I've had this for years, paid 75 shipped. 1950s written all over it. Is that the larger 5.5" diameter bell rather than the 5" bell? The weight suggests marching band to me. Too heavy for a crash ride or a crash from that era. Those are the other 18" cymbals which get the larger bell -- presuming I'm seeing it properly and it is the larger bell. I've got a full review of model ink on 18" cymbals lurking somewhere which I might be able to dig up. Regarding JP’s pic, this particular doesn’t have the hammering all the way to the edge visible from underneath. I had a 20” with rivet holes that had pronounced hammering that had a 50s stamp. I sold it to someone here. Maybe Kevin O...? This one measures 19 15/16”. It’s (I’m guessing) medium light in weight. There’s definitely some give to it. I’ll get it on a scale once I’m home. And I’ll post up more pics as well if anyone’s interested. I’m at the pics on my phone, the bell just looked like it had the Italiano vibe. But yeah, anything that isnt cracked is worth that asking price. And if it is 50’s Zil, I have a pair of 15” hats and a heavy-ish 19” that came with a hollow-block 22” that have incredibly hard to see stamps. Hammering & lathing all match, so I can believe they’re from that era. 1950s written all over it. Is that the larger 5.5" diameter bell rather than the 5" bell? . I was thinking it could be a marching band cymbal. I've used it as a crash/ride in a drums/organ duo with satisfactory results. I just take one quick glance, I can even see possible Trans stamp on the beebs mystery pie(smooth sloped bridge, hand hammer, multi lathe bits, umbrella bow and taper) When you've had 100's of these go through your hands you start to get a knack for visual Id. But as usual I have no facts just shooting from the lip All I know for sure it was made sometime within the last 90 years! The man with one watch knows what time it is. The man with two watches is never sure. This is Italian because of the swirls, particularly on the bell. Note also it is undersized. The swirls on the top of the bell are not due to Rotocasting as people keep claiming. These cymbals are gravity cast in a mold in the shape of a cymbal. Rotocasting (spinning the mold) didn't start until 1974-1978 (depending on which sources you use). What the swirls represent is a kind of lathe chatter due to the particular combination of lathe and tool which was in use. This comes from my own research work and was verified by UK cymbalsmith Matt Nolan (pers comm) who reported them appearing on his cymbals when he was lathing them. Note also that some of the Italian manufacturers (Tosco) never spun the molds. This doesn't stop people from seeing Rotocasting swirls on Tosco cymbals as well as 1950s UFiP cymbals. The hammering and lathing are also a bit different, but that is a more subtle difference. I would not be able to pick the difference between Avedis Zildjian and Italian origin on this particular cymbal if I didn't have the bell swirls and smaller diameter than 22" to start me off. I've got the larger images from the auction where it is easier to see the lathing, but I've just attached reduced versions here. There are also quite different bell shapes on the 1950s UFiP cymbals compared to the Avedis Zildjian of the same time. The UFiP cups are much more vertical sided. But this example looks more 60s and the cup doesn't look as distinct to me.